Preparation time: 5 minutes. Marinating time: at least 2 hours. Cooking time: approximately 16–20 minutes. Place chicken in a zip-top bag. In a small bowl, whisk together remaining ingredients and pour over chicken. Seal bag tightly and shake gently to coat chicken well. 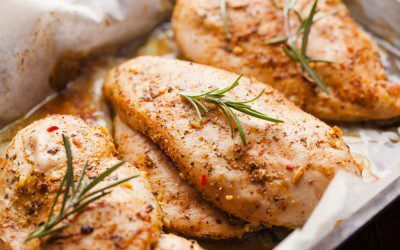 Allow chicken to marinate in the refrigerator for at least 2 hours, shaking bag gently twice during marinating to recoat chicken. After chicken has marinated, discard remaining marinade. Preheat grill to medium-high heat, or preheat oven broiler. Grill or broil chicken about 8–10 minutes per side, or until chicken is no longer pink and the juices are clear (cooking time may vary depending on the thickness of the meat).